Since March when I plunked down my bags on the well-worn oak floorboards of my TenderNob flat, I've been busy making the kitchen look less like it faces on a garbage chute, and more like some chickens could wander through at any moment. 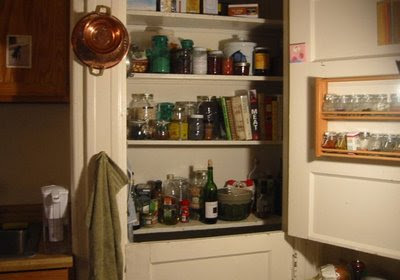 My favorite thing is the pantry with its dutch door, which faces on crocks and jars and tomes. And now -- if the old desk lamp over the stove didn't do the trick -- I can officially call it my office. My laboratory. My nursery. There's a little something in the oven, and it's due before I turn 25. The learned culinary historian Ken Albala and I are putting our crocks together and making an antiquated cookery-book, which Penguin/Perigee is being so kind as to publish, probably in early 2010. Anyway, now I can be an author writing about venison hearts and rice pudding! Very exciting. Congratulations- on both your home transformations and your book:-). wow cuz! this is brilliant news, I eagerly await your upcoming cookbook masterpiece! Believe it or else, I was led here from Gary Allen's monthy food site updates! Literally while just wandering aimlessly. Remarkables.